Want to know one of the little known secrets of creativity? Making new connections between seemingly unrelated elements. There. That's it. Plain and simple. Drive in banking? Nothing more than the combination of cars and banking? MTV? The novel connection between music and television. Roller blading? Ice skating + roller skating. Now, of course, they are obvious, but there was a time before they existed when it took some out of the box thinkers to see what was really possible. And they did it by linking "A" and "B" to synthesize "C."
Is there a simple way to increase your ability to make these kinds of new connections? Yes there is. It's called the Idea Lottery. 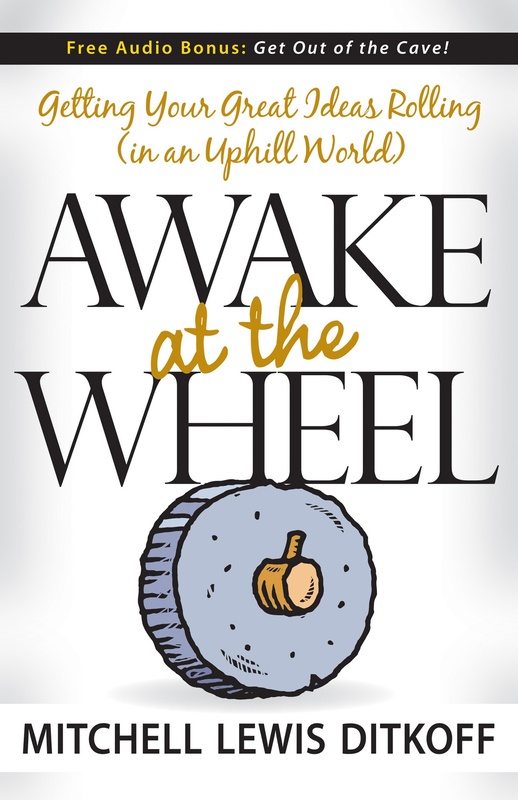 Awake at the Wheel wins Silver Medal in the Axiom Business Book Awards! This just in! Awake at the Wheel, my book on what it takes to originate, develop, and manifest BIG IDEAS has just won a Silver Medal in the Axiom Business Books Awards competition (Business Fable category). Needless to say, I am very pleased and hope this kind acknowledgment by the savvy business wizards at Axiom will encourage you to click here and order a copy (or ten) before the Sultan of Brunei buys out the entire inventory. A huge thank you to the fabulous Nettie Hartsock (digital strategist, publicist, and book champion) for encouraging me to enter. And another huge thank you to David Hancock and the wonderful people at Morgan James Publishing for seeing the value of my book (after 22 other publishers rejected it) and launching it lovingly into the world. PS: How does this relate to your life? It does, but only YOU know. If you make any connections, let us know. Happy leaping! Yo! Back in the day, whenever I wanted to hang out with other "creative types" I had to do weird stuff like pound my chest or send smoke signals at midnight. No more! Now there's Facebook Groups. Or more specifically, my new Create, Innovate, Get Out of the Cave! group -- a place for aspiring innovators to gather round the cyberspatial fire and stoke the flames of creation. Hey, don't be a neanderthal! You're not in this alone! Dig it. I struggled to invent the wheel thousands of years before the Mesopotamians (who got all the credit). I had, like, one friend, Ugh, to help me through the process. But YOU have thousands! And they're all starting to meet here. Need proof? For Seth Godin's Alternative MBA program, this week nine forward thinking (and very prolific) wizards each came up with 111 business ideas. But ideas are only valuable when someone (like you) makes something happen. What follows are their 999 business ideas, free for the taking. If you see one you like, let us know. If you need some support developing the idea or maintaining your inspiration, click here... or over here. OK, movers and shakers, business leaders, entrepreneurs, creative thinkers, and other assorted humanoids adversely affected by the crumbling global economy... it's time to embrace the fact that the difficulties you're facing actually have a SILVER LINING. The old forms are dying. Everything you were depending on is no longer dependable. For many of you, it's back to Square One -- time again to reinvent yourself, your business, and your way of relating to the world. Is this a problem? Only if you think it is. And only if the required imperative to adapt and change puts you into some kind of catatonic state. You can't afford the luxury of obsessing about the past or blaming the banks or Bernie Madoff or your company or Wall Street or whatever. It's time to take the bull by the horns. (Or at least wave a red flag instead of a white one). As the Roman poet, Horace, so eloquently said: "Adversity reveals genius, prosperity conceals it" -- the Italian version of that old saw, "Necessity is the mother of invention." So... may all you latent geniuses of the world rise up and embrace the moment of change that is upon you. And remember, you are not in this alone. Join forces with others! Create alliancies, collaborations, and partnerships with people who bring something to the table -- and who realize, as you do, that now is the time to make magic happen.